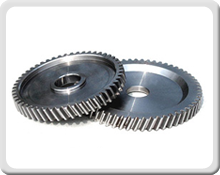 Helical Gears Manufacturers & Suppliers in Mumbai,India. A Helical gears connects parallel shifts and can be used to mesh two shafts that are not parallel. It can also be used in a crossed gear mesh, connecting two perpendicular shafts. Being one of the most trusted names in the industry, our company has been able to serve our valued clients with a wide range of Helical Gears. These gears are manufactured using optimum quality stainless steel, hardened steel, carbon steel and many other metals and metal alloys. We offer these gears in the specifications of 600 mm O.D. and Module 12. These gears have high load bearing capacity that makes them highly reliable. We offer these gears in different dimensions and grades suiting best with the demands and requirements of our esteemed clients. Home | Company Profile | Our Products | Feedback | Contact | Precision Gears Manufacturers | Timing Pulley Manufacturers | Spur Gears Manufacturers | Helical Gears Manufacturers | Worm Gears Manufacturers © Copyright 2012 M.MESTRY ENTERPRISES. Designed & SEO By Galagali Multimedia Pvt.Ltd.